This time around, we had all of our documents in line. Our background check was recent and all our papers had been notarized again as the notary always dates her signature. 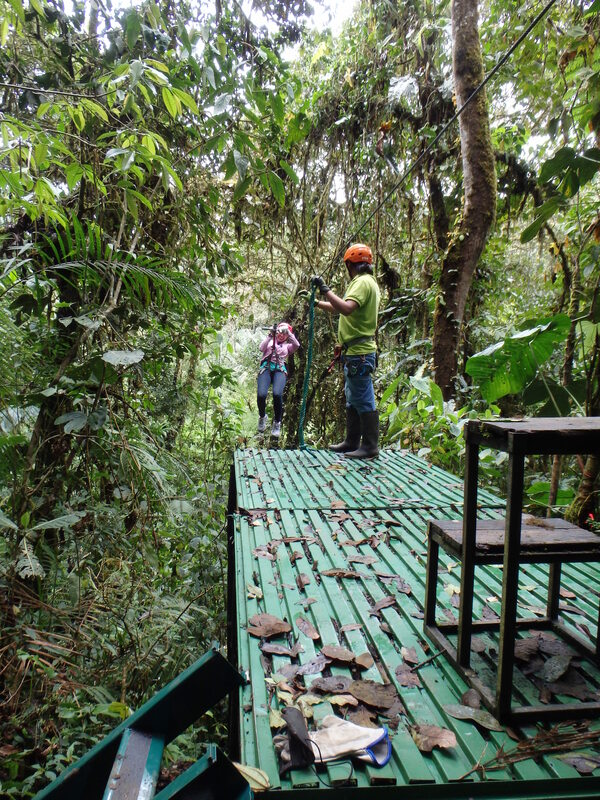 We knew we needed more consecutive time in Ecuador for construction so the time had come. Captain and I had saved a good bit of money to begin our life in Ecuador and were ready to start building our dream. After many months of working with our advisors, we were finally applying for our visas! Our U.S. matters were settled and Ecuador was going to be home for the next two years! Ecuador was going to be home for the next two years…hm…reality was setting in. The internet has sure made this world a smaller place and allowed people to stay connected no matter where they are in the world. So for someone like me who finds personal relations so important, the internet has allowed me to be a ways from home but still feel there. But out in our parts, it took some effort if I wished to connect with others. To send an email, I had to make the 30 minute winding drive to the noisy internet cafe in Tonchigue. Of the fifteen desktops, three are typically playing loud music and the other eight occupied are blasting childish and sometimes violent computer games. To make a Facetime call or use my Magicjack landline, wi-fi was an hour away in Atacames. Captain was hesitant about me traveling alone so he always came along. And because the House on the Hill wasn’t puppy proof, Miles and Grace came along as well. Because the trip to Atacames was lengthy, we also ran our errands. By the time errands were finished, the sun was high in the sky, the dogs were getting hot and Captain was anxious to get back home. The short time I had on the internet was not the quality time I loved sharing with those I cherish. I tried to plan my interaction attempts around the routines of others. “Maybe I will catch her on her lunch break.” “It’s the end of the workday. Hopefully she picks up.” “He’s at work so chances are he’ll get my email right away…” But often times there were missed calls, poor connections and a longing to reconnect with my loved ones. Watching television has never been much of a hobby of mine. But when Captain got Direct TV, I started having a “social life”. Turning on the television to my favorite shows was like meeting up with my best friends. Hanging out with The Big Bang Gang. Laughing at Nick and Jess on New Girl. Sympathizing with Adam on The Goldbergs. When the Voice was on I speculated which contestant was Mom’s favorite. Watching Modern Family, I knew Sis was laughing at all the same moments. How I missed my friends and family so much. Getting gas one day a motor bike caught my eye. This bike was quite different from the others covered with decals of naked women and sports drinks. Plastered all over this one were Indianapolis 500 decals. Opening the Hulk’s driver side door, I noticed a decal that read: assembled in Fort Wayne, Indiana. Our truck was built an hour away from my home town and made it all the way to us here in EC. One episode of Marvel’s Agents of S.H.I.E.L.D. Agent Coulson and his team were in Muncie, Indiana. Some of my funniest memories are with my college buddies in good old “Funcie Muncie”. Publishing a chapter was no longer a simple task but the connections created between me and my readers inspired me to continue telling my story. The moral support and genuine offers I’ve received from my readers is unbelievable. “If you need anything from the States, please ask. I would happily send it to you.” “We haven’t heard from you in a while. How is your building coming along and more importantly, are you okay?” “I’m going to ask my Ecuadorian family if they have any friends there in the North we can connect you with.” Another woman suggested sending her husband to help us with our building. I was amazed at how inspired others were by my story. Their comments of “courage and bravery” helped me better understand this challenging path that I’ve chosen. The matter of fact comments like “well-thought out, brutally honest and very informative” showed not only was I a character in a story but I was helping others in similar situations. Living a gypsy life as I have for almost five years now, often times I’ve felt “out of sight, out of mind”, wondering if I was a forgotten one. When family reaches out and lets me know they are still reading, I feel so good inside knowing they think of me and I have their support. For so long though, I was over-extending myself clinging to relationships where I was putting in way more effort than the other person. I’ve had to redefine what a healthy and happy relationship means to me and in doing so, many of my friendships faded, fizzled out or burst into flames. What ever the reason for our lost connection, I am learning to not take any of it personally. This is life. People come and go. Thereafter I began having random encounters with quite fascinating people. While driving through our small town one day, a tall blonde woman caught my eye. She was carrying a surf board and a really big back pack. There aren’t many blondes in our parts so I smiled at her and thought “you’re blonde, too!” She smiled back and approached us. The brave woman was from Holland traveling on her own and was looking for a hostel for the evening. While helping her arrange lodging for the night, it came up in conversation that she had already read all the books she brought on her trip. Holly joined us for dinner, borrowed a book from my library and we laughed all night while sipping wine and swapping stories. She told me about her aspirations of beginning a surf community that protects the waterways of Ecuador. 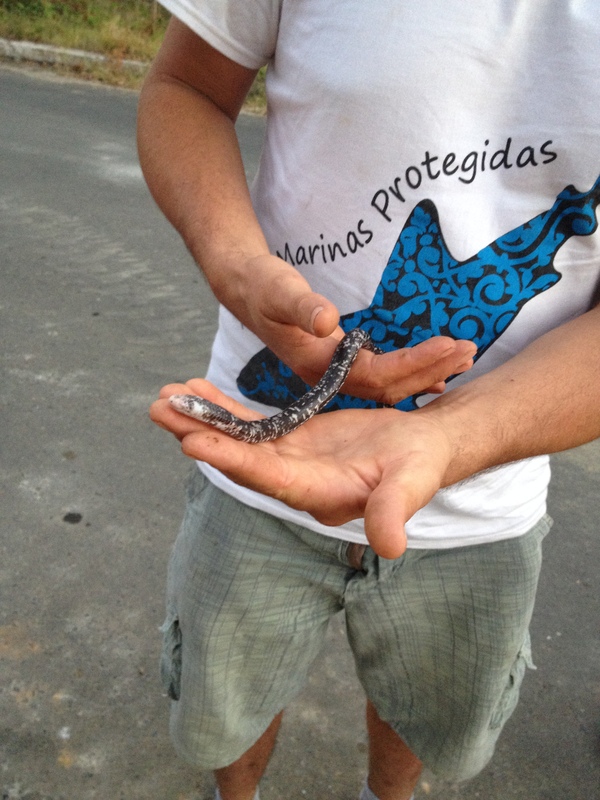 Another day Captain and I were stopped at the end our drive because a slithering creature had caught our eye. A jeep passing by screeched to a halt and out jumped three men. The leader of the troop, Curious George was so excited with what we had found. What looked like a snake was actually a giant warm. He told us about his conservation efforts, other conscientious neighbors and encouraged us to visit his home in the next town over. I couldn’t wait to learn more from Curious George about composting toilets, raising chickens and farming in this climate. Not too long thereafter, Captain and I had stopped by George’s to learn more. George wasn’t there but when we turned around to head back home, before us stood a tall, skinny white guy. “I’m Leaf. Great to meet you guys.” Where did he come from??? “I’m renting a little cabin here in the woods.” He literally came out of the woods. He was a young American living part-time in Ecuador and dreams of a wellness community. 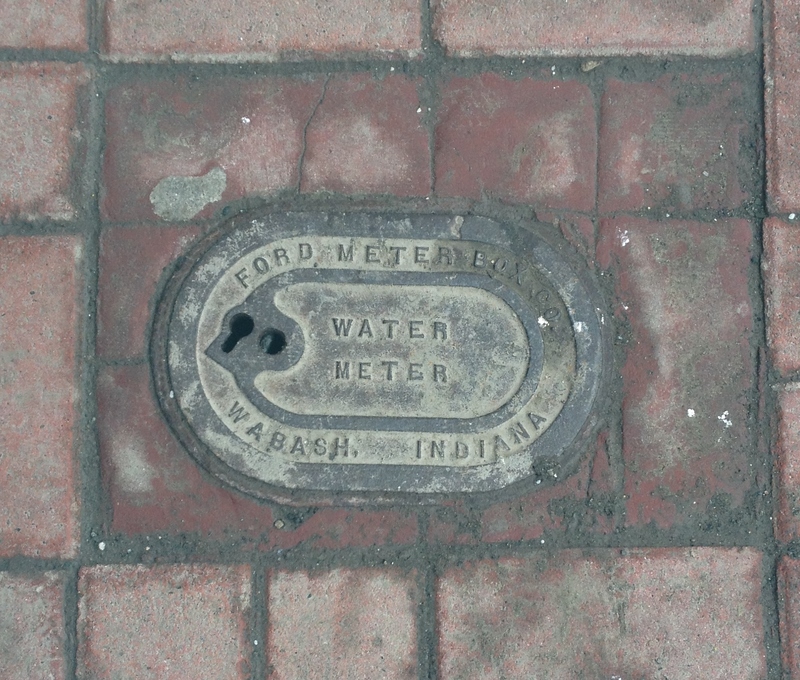 Conservation was a focus of his as well. Coming together with a community of concerned citizens felt good and helped me feel more welcome to the area. But still, nothing feels more at home than being with my family. Mom started asking questions about specific dates and I knew she was getting serious about visiting. Emails were more frequent and when Sis told me about her approaching vacation time, I knew Mom found a travel buddy. Soon I’d be getting an email with flight confirmation. I had been preparing for my family as well. The guest room was cleaned and feng shued. The landlady’s linens stash was found and I chose the prettiest set of matching sheets. I’d bought boogie boards and beach chairs so us girls were ready for our fun in the sun! We were going to spend our week lounging on the beach, taking surf lessons and beach combing. We asked around in town and were told the following day a new pump was being bought and we’d have water at this time. Great. We would be leaving for Quito but luckily we had cleaned the whole house except for the guest bathroom. I planned to do this first thing when we returned as a clean bathroom is incredibly important when having guests. 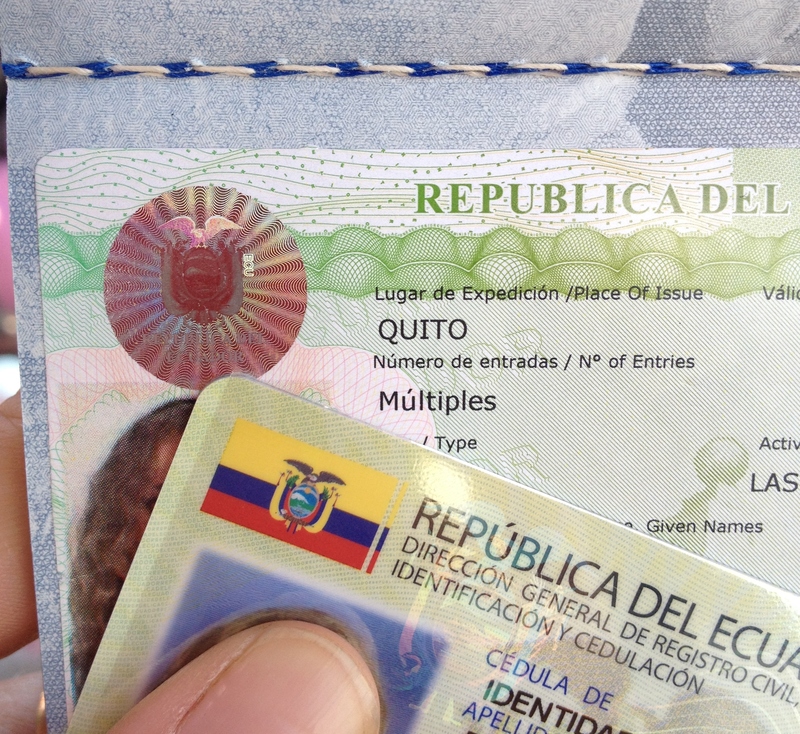 Forty-eight hours later our passports were returned to us with an addition, an Ecuadorian visa. We got our picture taken again and then headed to another government building where we would obtain our cedulas. A cedula is an important identification card necessary to open a bank account or get a cellular plan. We took a number and patiently waited until we were called. When the man called my number, I answered a few questions, got my picture taken again and was told to come back to the window in two hours. A few hours later, I had my cedula! Alas!! After a long paper trail, Captain and I were finally legit! What a relief…I didn’t want our visa ordeal getting in the way of the girls’ visit so I was thrilled! 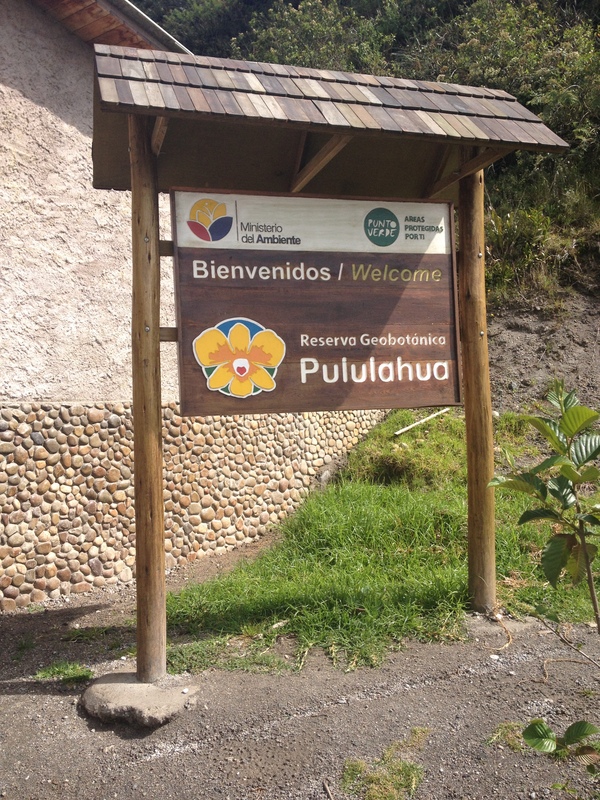 With the new airport moving outside of the city, the Quito lodging with our advisors was no longer near the airport. So it was decided that I would take the old airport/new airport shuttle to meet Mom and Sis and we’d then take a taxi back. I was a bit nervous as this was my first time I’d really been alone in Ecuador. Captain was always by my side when traveling so it was terrifying and exciting all in one. Anxieties fluttered about. Why didn’t I leave for the airport earlier? Will Sis be perturbed they had to wait on me? How nervous will Mom be if I am not there? Were my plans for their visit going to go smooth? Should I have planned more things for us to do? What if they didn’t have fun? What if they didn’t want to come back? I then wondered if I was feeling anxieties of Mom and Sis. What is causing them to worry? Was everything okay on their flight? Are they having issues with luggage? Ahhh!!! Okay…it was time to stop worrying. We were all a ways from home and everyone needed to relax. I’d get to the airport when I got there. This was a time to be happy. There was much to celebrate. I was traveling alone in Ecuador! Mom and Sis were visiting! Don’t worry, be happy! What I love about true friends and family is no matter how long it has been, when you meet again, its feels like it was just yesterday where you left off. And that is exactly how it felt seeing them at the airport. Here we were quite a ways from home but when I saw the two of them, I couldn’t have felt closer to it. She was looking over the driver’s shoulder with her eyes glued to the road. “Geeeeeez,” she gasped with clenched teeth. “Mom, its best if you don’t watch.” I couldn’t convince her to look away so I continued my conversations with Sis as Mom sat on my left, flinching around every curve and each pass. “This is going to make me sick,” Mom said. I knew what she was talking about. Public transportation always made me a little queasy. But these drivers going so fast, passing on both the left and the right, they take nausea to a new level. I would have suggested she move to the front seat but I knew that would only make the experience more terrifying being that much closer to the windshield. That morning we got an early start as we wanted to make it to the coast by dark. 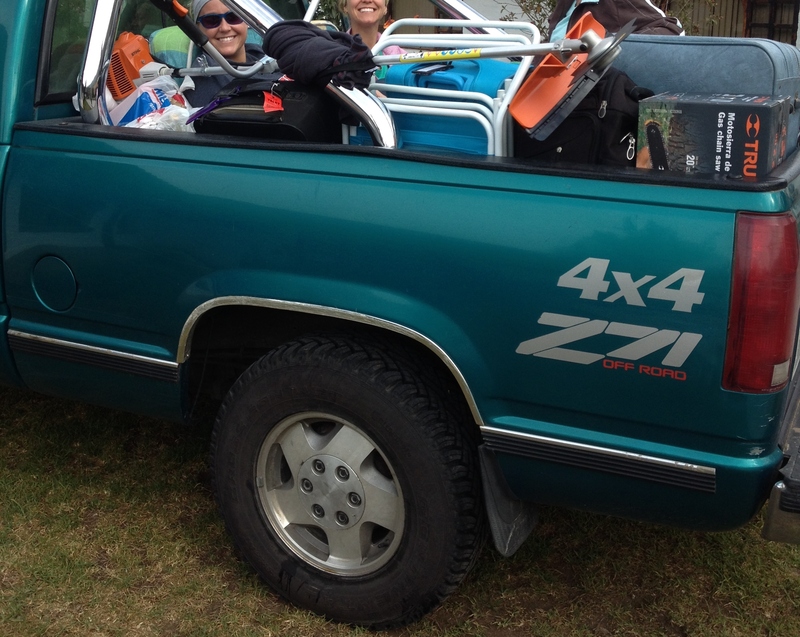 Packing the truck was a timely task as we all had quite a bit of baggage. The girls had their luggage as well as the few bags of goodies for me. We had the dog kennel, a new chainsaw and weed wacker as well several light fixtures for our rooms. (Captain and I had taken advantage of being in the city and spent our free day shopping at the Gran Kywi.) With two dogs, four adults and a good-sized mandarin tree, the small amount of spare room was perfect for the mattress I’d brought so our ride would be a comfy one! The dogs hopped in the front with Captain and us girls got cozy in the back. The infamous markets of Cotacchoci and Otavalo were hours out of our way home and meant spending an extra night in Quito. I promised Mom next trip I’d take her to the best markets but this trip we were going to check out a new market I’d heard about. It wasn’t far and would give her a taste of what she would find in the other markets. The market was just a short detour from one on the main roads leading to the Mitel del Mundo. In no way was it a substitution for the grand markets but this was her best opportunity to do a little shopping on this trip. A beautiful sign welcomed us in and we made our way to the shops. There were four booths inside a cozy building and even clean public restrooms for visitors. There was sterling silver jewelry, leather belts and shoes and hand bags of all sorts. Sis bought a hand carved tomahawk for her boyfriend and the classic cream-colored Ecuador shoulder bag for herself. Mom thought of all the gifts she wanted to bring home but there just wasn’t the selection she had hoped for. But she was happy to find a big fluffy wool sweater to keep her warm on those really cold days in Indiana. 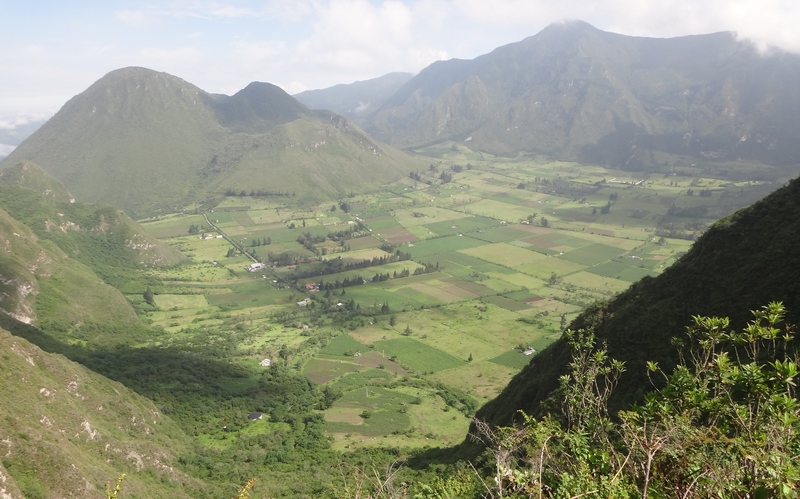 The shopping may not have been as grand as the markets in Otavalo or Cotacchoci but what a spectacular view!!! Approaching the platform for landing there were many things to consider. Keep your feet up so they don’t catch on the platform. Brake when instructed. Too hard and you’ll stop a ways from the platform. Too soft and you’ll end up body checking the guide’s assistant that has no other choice than to stop you with his body! With the oversized work gloves, braking was not so easy so we all got some good laughs with our crash landings. Off to the coast we went. It was over a four-hour drive so us girls got comfortable. With the exception to cloud forest, it is typically a dry ride but I told Mom and Sis to have their rain coats handy. I was facing forward and noticed a tall dark cloud that was approaching us very quickly. “I think we are going to get wet!” Sis quickly pulled out her raincoat and slipped it over her head. I then realized I’d been so focused on telling them what to pack, I didn’t pack my own raincoat. Ahhh!! “Here, I have an extra emergency poncho!” Before Mom handed me her emergency poncho, big raindrops started to fall. 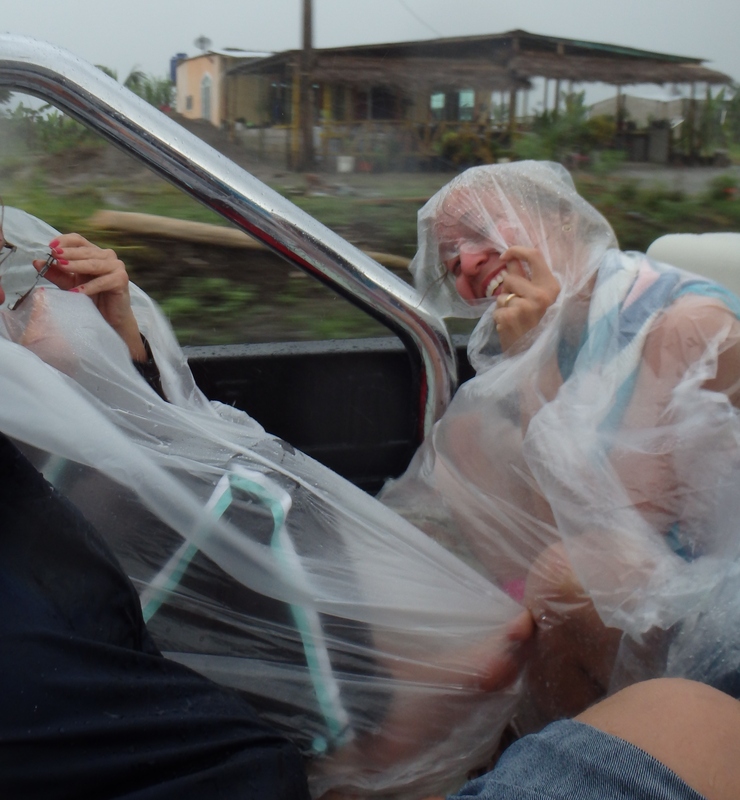 The plastic ponchos were blowing in the wind, twisting and turning and making it nearly impossible to put on. Mom’s poncho was a glorified trash bag and was shredding into pieces with the intense winds. I was facing forward so when I finally got my poncho on, it got stuck to my face and became a serious suffocation hazard. The rain was falling hard and we were laughing even harder. How great it was to have a good laugh with the girls. When the rains stopped, Mom held up her trashed trash bag and said, “I don’t know why I didn’t get my raincoat out because this didn’t do a damn thing!” Again, Mom had me and Sis laughing hysterically. On our way home to the coast, Mom and Sis soaked up the sunshine and got the tour through the Andes. “This way to rafting.” “That way to ancient burial grounds.” “This is where we were when our shifter broke off the Lada…” They took in the view from the back of the Hulk. Rolling hills topped with pasture and aged jungle ravines, they were amazed with the standard of living. Mom made an interesting observation. “For as poor as they live, they all dress in pretty nice clothes.” It was true. Even in our incredibly poor village, most of the ladies always wore cute outfits and had nicely manicured nails. “Welcome to your home for the next week!” Their first days in Ecuador and Mom and Sis were living in a house without water. Mom wanted a true Ecuadorian experience and she was about to get one. How soon before they start missing home?